have the same sophistication level? No! Why rent a Mercedes Sprinter Camper Van? Our SOLAR Sprinter Van-Campers are THE most refined, and luxurious Van-campers (Class B ) available in today’s market. Stay “OFF THE GRID” with a constant supply of electricity via the solar power charged auxiliary batteries. Operate your major appliances without a generator in the new inverter/solar models! They are “best in class”: refined and sophisticated electrical, water, and waste systems, and the greatest comfort. The ability to seamlessly move between a couch, a dining area, and bedtime configurations: king bed or two twin beds…. Add to this, our inclusion of high end cabin amenities that are unmatched by ANY rental dealer, anywhere! Think of the convenience of always having your own kitchen. Whether you are parked or on the fly, use the refrigerator, microwave oven with convection, stove, external propane barbecue connection, 2500w quiet inverter to power your major appliances,and cabinets to store plenty of food, dishes, pots, pans, utensils and more. You will always have hot or cold drinks and snacks nearby and readily accessible. When it’s time for a meal, instead of grabbing unhealthy fast food or stopping for a long time at a pricey restaurant, why not whip up your favorite dish while you’re at that beautiful scenic overlook or tailgating before the football game? Think of how much money you’ll save by shopping at grocery stores instead of convenience stores and restaurants. When you are traveling, enjoy a meal indoors and in the comfort of up to four swiveling captain seats at the front or a dinette at the rear (some models). Or enjoy eating outside under the electric awning (for protection from rain and excessive sun). We know how hard it can be to find clean bathroom facilities when you are on the road and how uncomfortable it is when you have to “hold it” until you do (and you don’t know how long you have to “hold it” for!). With your own bathroom, you’ll never need to use a gas station or rest area’s dirty or busy facilities again. In fact, if you’re not driving, you don’t even have to stop! * You won’t have to wait in long lines at crowded events nor take long walks to the campground bathroom in the middle of the night. When you are out in the boonies, a real bathroom provides superior comfort and privacy to a bush. How nice would it be to be able to shower whenever you need it? You can spend a day at the beach then wash the sand off your feet (and the kids and the dog too) right beside your vehicle. Or go inside and rinse the salt water off your skin with warm water and privacy. Wouldn’t it be great after a day of strenuous activity like hiking or mountain biking and not have to drive home or crawl into your luxurious bed all sweaty? There may be times when you’re staying in remote areas (like Federal lands) or wilderness campgrounds with no showers. Sometimes when you are staying in a campground with showers, there are times when it’s nice to have your own shower, no more cold mornings with no heat, no more campground showers out of hot water or not clean enough; no waiting in long lines or fighting off too many mosquitoes. Have you had enough of waiting in line to use a dirty change room at the beach, or changing clothes behind your car door with a towel? Our campervans provides you with a clean, private, climate controlled (cooled by A/C or warmed by the furnace) place to change anytime. It comes in handy when you’re out for the day in shorts and want to change into pants for the cooler evening. And then there is a number of outdoor activities (skiing, field sports, biking, etc.) that require clothing that may be dirty, sweaty or uncomfortable to drive in. In addition to using the comfortable sleeping accommodations overnight when you’re traveling, there are plenty of other times they come in handy. Whenever someone is tired, you can pull over and nap in heated or air conditioned comfort. Aside from when you’re traveling, there are many times when having your own bed proves very convenient. 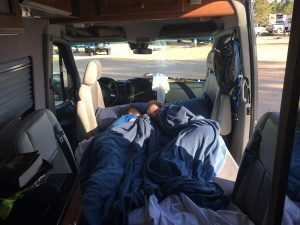 ANY TIME someone needs a nap, there are comfortable beds standing by in your Sprinter campervan: while your spouse finishes shopping, during the kid’s soccer tournament, a rest while attending the dog show, or a break from the sun at the beach. To sleep your third or fourth small framed person ( up to 5’8″) you will need to add the folding mattress accessory to your rental. Functional and comfortable and certainly much better than a sleeping bag on the ground! Instead of being forced to stay in the same seated position for hours at a time on a long drive, our vehicles offer room to change your seating position, stretch and move around. Talk about making long trips much more enjoyable! Wouldn’t it be nice to always have a roomy place to unwind away from home? Our Mercedes campervans have up to four swiveling and reclining captain seats at the front and a power sofa or dinette in the rear. The space to relax extends outdoors under the awning which provides protection from the sun and rain. Whether you’re playing cards or just lounging around, these campervans fit the bill. With separate seating areas front and rear, there’s room for different activities at the same time. Accommodate your partner that wants to watch TV in the rear bed or power sofa while you read a good book in a front captain seat. This flexibility really comes in handy, particularly on rainy days. Built-in entertainment systems are available in many of today’s vehicles, but how many offer a home theatre system with a 21″ flat screen TV and surround sound? Some of our rigs have Air-TV: allowing you to pick up the local signals or your favorite game anywhere. How great is that? How many vehicles offer entertainment systems that can be enjoyed while the engine isn’t running? How many offer multiple vantage points – you can enjoy your favorite DVDs AND watch the sunset! Independent heating and cooling systems allow you to maintain the perfect temperature while it’s parked in a wide range of climates. These systems make our camper vans comfortable while living in it on vacation AND more versatile to use close to home. Our Sprinter Camper Van’s utility systems (110 and 12V electrical power, fresh & waste water plumbing, propane, comfort heating & cooling, refrigeration, cooking, etc.) can operate independently from external connections through the use of on-board tanks (water & propane), solar powered batteries and optional 110V power generator or the incredible new inverter systems. Batteries are kept charged thru the solar panels, and inverter systems for all electrical needs; non-solar unit battery systems can be re-charged by the generator, driving the RV or plugging in at a campground.. When you are staying in a campground or state park with external connections for electrical power and fresh & waste water, you can take advantage of these connections to extend your stay beyond the capacities of your water and waste tanks. Wouldn’t it be great to not impose when visiting friends or family overnight? Stay in your Sprinter RV/Camper Van instead of their “guest” room (or kid’s bedroom!). Sleep in your own bed with your own sheets, blankets and pillows instead their saggy mattress (or sofa bed) and flat pillows. Use your bathroom instead of theirs. And best of all, have a private sanctuary to call your own. Having guests over yourself? Whether you’re tight on space or not, with a Sprinter RV/Camper Van in the driveway, you’ve got a fully furnished separate guest suite with privacy assured for both you and your visitors. Thank you for providing an amazing trip across southern Utah! You have a fantastic team that made our trip amazing. Amber met us at the airport and explained the mechanics of the RV thoroughly where we had no problems with the operation of the vehicle. We didn’t need to open the operating manual! On a smaller note, but so important to me, she told us about a grocery market on our way out of SLC. We were floored with the quality of the market. She is a professional with a caring heart. Jim, our concierge, burned the midnight oil to come up with an itinerary we followed religiously. With such short notice, he put together accommodations, places to visit, trails to hike and even a grocery shop to replenish our RV. He knows his national parks! It was our first time RV’ing and it won’t be our last time. You provide an excellent product! We have been dreaming of purchasing our own Sprinter van and possibly living in it one of these days. To help decide whether we really wanted to do it, we rented a Roadtrek from Sande for a week. We had so much fun we rented two more times in subsequent summers. Each time we felt pampered because the vans are stocked with everything needed to have a outstanding trip. Quick and knowledgeable support was a phone call away whenever we had a question about how to operate the van. Sande is fiercely intelligent, highly technical and runs her business with utmost attention to detail. It had been a pleasure getting to know her all these years! We learned a lot on our first go round and had a real good time. We very much appreciate you reimbursing us for the campground fee so that we could take showers. When we revisit a Mercedes Sprinter we will certainly come to you.You and your team are excellent and proved to be very fair. I just wanted to show you what a great time we had with your rig Kerouac in Utah. The kids renamed it 'The Whole Enchilada' for our trip since she had everything we needed! (pictures on Gallery page) We appreciated all the little touches that made it easy for us to just show up and live and cook in a van for 10 days! We had great adventures and made memories for a life time. "...a spectacular, eye-opening experience into nature! And especially, thanks to you, playing a major role in making sure (as much as possible) we had the best adventure possible, and we did!" "Other than a little of the Moab desert along for the ride, everything is in tip top shape. We even weathered up to 40 mph wind gusts while camping! We loved the inverter system with the solar panels. Your 3 day rule of thumb for fresh, black and gray is very accurate for usage without showering. The outside shower was a great feature. The vehicle is a dream to drive especially with mountain driving and diesel fuel. You have a great company and great business model." "Thank you again for a wonderful rental"..
"Sande at Stay Adventurous, is an amazing resource. Not only did we get excellent technical and logistical advise on our first ever Road Trip in a non-auto vehicle, she inspired us with wisdom and encouragement as we hit the road. Because of her guidance, our Road Trek adventure was a huge success, it exceeded our expectations, and left us with memories that are indelible. Trust your trip to Sande and her fleet of memory makers! She is a rare gem and has become a friend." "I learned of your service from a neighbor who recently rented from you and he absolutely RAVED about you and your service, and recommended that I contact you. I did and of course you lived up to the billing. Just thought I’d pass along some very positive news and the good referrals that you and your team generate." "Sande, Monty and I want to thank you for making our vacation so very extra special! The Sprinter was a home-away from home. I slept like a champ and we loved all the special touches you provided. Continued success!" "Roadtrekking was great. Smooth, fun and what an amazing vehicle! Orientation served us well, and there were no surprises. It did everything we asked it to do and more." "Thanks to you Sande - you were instrumental to the success of our trip. Until the next time..."